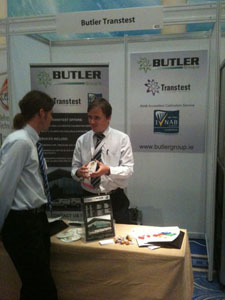 Visit Butler Transtest currently participating in the MEDTEC Ireland Tabletop Exposition (22-23 September 2010) at the Radisson SAS Hotel in Galway. Butler Transtest Ltd a leader in calibration services in Ireland is attending the exposition to market our calibration capabilities to the different medical device manufacturers. Butler Transtest is positioned at stand 421 CLICK HERE TO REGISTER for complimentary exhibition visitor admission and save the €25 entrance fee. The two day exposition, organised by MEDTEC Ireland, will see the top fifteen of the world’s top twenty medical device manufacturers showcasing their leading medical device technology. For further information email: sales@butlergroup.ie or call +3531 6292620. Pictured above: earlier today, Ronan Casey of Butler Transtest Ltd showcasing the company’s calibration expertise to visitors at the exposition. Both Aaron Joyce and Ronan Casey will be happy to deal with any of your calibration questions or give you a quotation for laboratory or site calibration.